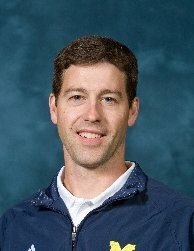 Kasey Hughes is entering his 5th year coaching the Wolverines, and has also been coaching at the high school level for the past 8 seasons. In Ginny and Kasey's first year leading the Wolverines, the team accomplished numerous firsts for the current players and coaching staff, including a first trip to the "final 4" at Nationals. Kasey has also helped coach the Birmingham United High School Girls team to four MHSAA Division I state titles in the last 6 years. Kasey specializes in midfield transition and attack, as well as overall team tactics, substitution strategy, and draws. Hughes spent the first 2 years of his undergrad career at Andrew College where he was a member of the varsity soccer team. Kasey was a midfielder and defender on the 1992 Men's Soccer team which finished the season with a record of 24-1-1, with the team’s only loss coming in the national championship game. While at Andrew College, Hughes was on the Dean’s List and a member of the Phi Theta Kappa Society - the junior college chapter of the National Honors Society. Hughes then transferred to the University of Central Florida where he initially studied Early American History, but later shifted to the Business School. He graduated with a BSBA in Finance with a concentration in Accounting in 1997. In the Business School, he completed four straight semesters on the President's List (4.0 GPA). Hughes began work after graduation with IBM Global Services as an Associate Consultant in the SAP Implementation Practice. In his 7.5 years with IBM he ascended to Senior Consultant. He held project positions of FICO consultant, Integration Manager and Project Manager. His client list included Lockheed Martin, IBM Server Division, US Army, US Treasury, and Ryder Trucks - to name a few. Hughes left IBM 8 years ago to start his own SAP consulting company, Summit Solutions Group, where he continues to specialize in finance roles in SAP project implementations. His Summit Solutions Group client list includes DTE Energy, GMAC, Price Waterhouse, and HP. Kasey is married to fellow coach Ginny Hughes, and they live in Birmingham, Michigan with their family. Their oldest daughter, Haley, turned 2 in July, 2012, and their second daughter, Morgan, was born on November 11, 2012.